Repaired Escapade, ready for a flight test. 2016-05-12 Well, the Escapade 40 is ready for a flight test. I purposely took the photo at left from back a ways so the sloppy repair work wouldn't be visible! I had to build a new firewall and install it, repair the cockpit/cover and rebuild the front cowl area just behind the engine. It turned out pretty well. After finishing all of that I took it out to the driveway, fueled it up and hit it with the starter. The ASP .52 engine started immediately! That after plowing into the ground so hard it ripped the engine off and then sitting in the garage for nearly a year through the winter. I did blow out the carburetor with my air compressor, including removing the needle valve and blowing air through there. But it took minimal tweaking to get it to idle smoothly and accelerate to full power without hesitation. One thing I did notice is that the ASP needle valve is very sensitive. Full power RPM after adjustments is 10,350 and it idles at 3100 RPM. I'm anxious to see how it flies. Maybe tomorrow! 2016-05-10 Well, today I decided to start repairing the Escapade. The first step was to fabricate a new firewall. I made it from two 1/8" thick pieces of plywood glued together with Titebond wood glue. After the glue was more than set I then cut and sanded the rounded top edge and drilled the various holes for mounting the engine and passing the fuel hoses and throttle control rod through. It was nice to actually get started on it. Can't finish without beginning! Newly fabricated Escapade firewall on the right. 2015-08-29 Met my son yesterday at our flying field around 10:30am. It was overcast and a bit threatening with rain showers forecast for later in the day. I mounted the wing on my Escapade, turned on the transmitter, then the plane and checked the controls. The left aileron didn't move! Oh yes, I had not checked it at home with the wing mounted... dumb trick. So back to the bench when I got home. I took the servo apart and found what I suspected, teeth from one of the little plastic gears floating around inside! Fortunately I had an identical servo on another wing that I wasn't using so that is now repaired. I did fly the PT-40 which ran perfectly, as it has for several years before. Amazing what a little split in a fuel line can do! It's raining today so it will be a while before I can give the Escapade another opportunity because my wife and I are going on an Alaska land/sea cruise for twelve days. 2015-08-27 Well, I decided to go back with the stock landing gear - after fabricating one from wire. I beefed up the area where it mounts quite a bit with three layers of 1/8 inch plywood. Now we'll see what happens. I committed to only smooth landings! 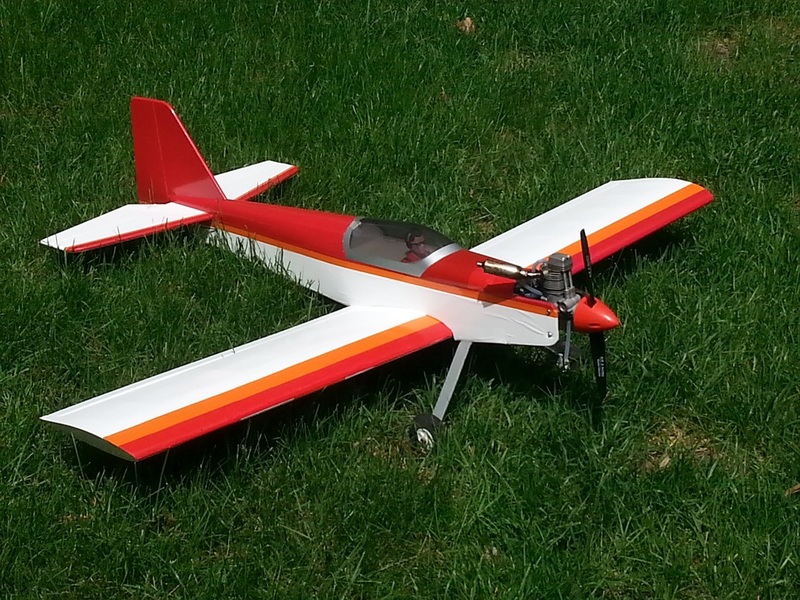 2015-08-25 A couple years ago after getting somewhat comfortable with the Great Planes PT-40 trainer I ordered their .40 sized Escapade. I put a .52 ASP 4 stroke engine on it and had fun flying it. It is a very nice plane to fly, stable, quick, just plain fun. I've had several different engines on it since and as I wrote a few weeks past totally destroyed it in a take-off stall. But I got it repaired and back in the air. Only to crash land it a few weeks back by coming in too steep and fast. The only damage was the lading gear. As I put it on the bench a couple days ago to see what it would take to put it back together again I was impressed that it potentially has three structural or design problems for a guy of my flying inability. The landing gear is completely rigid, no "give" whatsoever. So in the event of a hard landing the fuselage has to deal with ALL of the stress of that which leads to the second weakness. The landing gear, made of 1/8 inch thick hardened, rigid aluminum is 7/8th inch wide at the mounting point and mounts to a plywood sheet cemented into the fuselage which is itself only 1-3/4 inches wide. So all the torque of the landing gear has to be withstood by that little 1-3/4 inch connection to the fuselage. 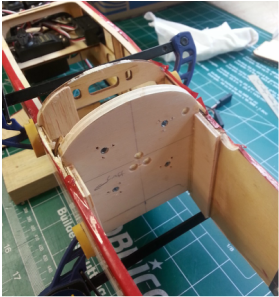 The third issue is that the gear struts are individual, that is separated so that the plywood sheet to which they are mounted not only has to handle the backward torque of a hard landing but the middle must not separate. In my case it did both, split in the middle and the twisted out of the fuselage. With minimal damage to the fuselage, by the way. Under reasonable conditions and a good landing that is probably more than enough. But if you come into the field too fast and as too much of a downward angle the likelihood of breakage is fairly great.